An important function at the Dayle McIntosh Center (DMC) is to facilitate access to appropriate communication for deaf persons. The sign language interpreter referral service was established in 1981 for this purpose. The program also provides a method to aid public and private entities in the community to comply with requirements in the Americans with Disabilities Act. Ariel Romero is the interpreter services specialist and Tracy Watson is the service coordinator. Due to the structure of the interpreter referral service, deaf individuals are not required to become consumers at DMC to receive this assistance. Any deaf individual in the program service area is eligible to benefit from interpreter services. A typical referral process is not relevant to the provision of sign language interpreter services. The operational procedures for the program will be described in the next section. The interpreter referral program is operated like a business component of the Dayle McIntosh Center. Entities in the community such as school districts, employers, health care providers, local and state agencies, and others contract with the Dayle McIntosh Center for the provision of sign language interpreter services. The conditions under which services are provided are detailed in the contract, as well as, the rates charged. When a deaf person is a consumer or employee of a contracting entity, and interpreter services are needed, a request is submitted to the DMC Interpreter Services Specialist. To avoid a higher hourly rate, requests should be made at least 72 hours prior to the time of the assignment. A two-hour minimum is applicable to all assignments. Contractors may cancel assignments without being charged a fee as long as the cancellation is filed more than 24 hours prior to the scheduled assignment. Interpreters, who are part of the DMC referral registry, respond to posted assignments in order to make their availability known. When an assignment has been accepted by an interpreter, he or she is responsible to provide assistance according to industry standards and the code of ethics established by the Registry of Interpreters for the Deaf. A voucher signed by the contractor is submitted to DMC to verify that interpreter services have been provided. Interpreters, who wish to be part of the DMC registry, must be evaluated by a team of highly qualified reviewers. The interpreter’s ability to translate sign to voice and voice to sign is assessed. Inclusion in the registry is based on evaluation results. Six performance and corresponding pay levels have been designated for the registry. Following evaluation, interpreters, who pass the assessment, are ranked based on experience, skills, training, and certification. Interpreters are not DMC employees, but rather independent contractors. A local business hired a deaf person and requested a sign language interpreter to facilitate communication for the orientation and training process. The Dayle McIntosh Center posted the request and a qualified interpreter accepted the assignment. The interpreter enabled communication between the deaf employee, the human resources department, the immediate supervisor, and hearing coworkers. Because of this assistance, the new employee was adequately prepared to do her job. A request for an interpreter was submitted by a healthcare organization on behalf of a deaf member. The man’s mother resided in an assisted living facility and required medical care. The deaf man was the primary caregiver and needed to understand the treatment plan for his relative. The interpreter provided through DMC was essential to ensure that proper care was provided. 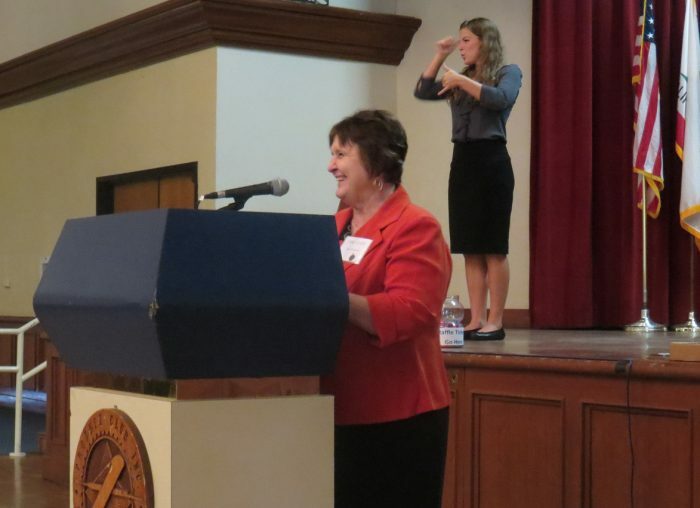 In the recent presidential campaign, one of the candidates requested sign language interpreters through the Dayle McIntosh Center for scheduled rallies. The goal of the candidate was to assure that deaf attendees would be able to understand speeches and other verbal interaction during events.